But you still need the product right? And its got to be good! 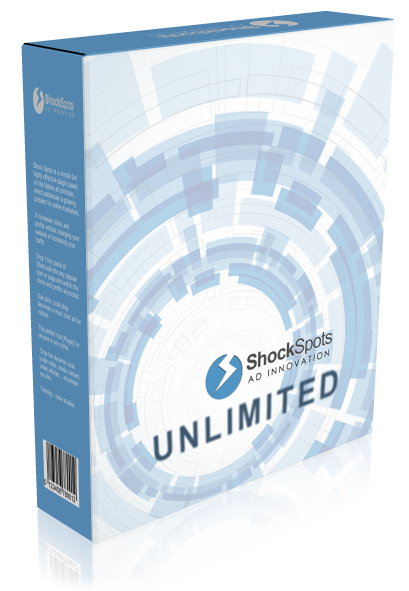 And ShockSpots IS Good – it helps people make more money from their website & from content & traffic they already have. Yes, it sells and it will continue to sell long after this product launch has finished. ... And; YOU can be one of the lucky few who continue to sell it… That’s right, on this page you have the option to purchase WhiteLabel rights to a complete ShockSpots business in a box. Fully coded, and without license encryption. Upload it and sell it as your very own product. $4000 worth of premium sales page ready to sell your new software product. We have you covered. Although this is all very easy we wanted to make sure you knew what to do. Selling software is hugely profitable - you know that right. That sales page, the one that you landed on and liked enough to purchase ShockSpots, well you get your own version of that very page. We really did spend a great deal of time perfecting that page to showcase our product in a professional manner. It’s simple (and we actually show you how simple in a video)… Upload - add your Name and payment link and BOOM – You’re in Business! Constant quality is what we do. We pride ourselves on getting each and every detail as close to perfect as we possibly can… and that even includes out download pages. Just like our sales page – you get your own version of this premium download page template. And just like the sales page this one is fully featured and ready to go. Layout, Graphics, Videos… in fact we've even linked the button for you. All you have to do is upload to your server… nothing to change or link (unless you really want to). Layout - Sales Copy - Colour Pallets - Graphics - You get the lot. Fully featured and ready to go - we even linked the download for you. Download the whole pack and then simply watch the video – you probably won’t need it… but it’s there if you do. Terms: By agreeing to purchase our WhiteLabel pack for ShockSpots you agree to abide by the following terms. 1. You may NOT begin selling ShockSpots to anyone before the following date: Monday 20th July 2015 (week after our product launch commences). 4. Additional products developed without Mark Bishop are not permitted to use the ShockSpot brand, logo, graphics, Copy, layout, proof, reference to Mark Bishop or anything else related to ShockSpots without the written permission of Mark Bishop.